Average farmland values in Nebraska rose about 5% in the last year and rental rates declined, signaling a change from the double digit increases of recent years, according to preliminary results from the 2014 Nebraska Farm Real Estate Market Survey. This week the UNL Department of Agricultural Economics released the findings in its Cornhusker Economics newsletter in an article written by Jim Jansen, research analyst, jjansen4@unl.edu, and Roger Wilson, budget analyst/farm management, rwilson6@unl.edu. They write: "Even with the strong increases in farmland values over the past several years and the reduction in commodity prices experienced during 2013, agricultural land markets in Nebraska remained steady early in 2014. 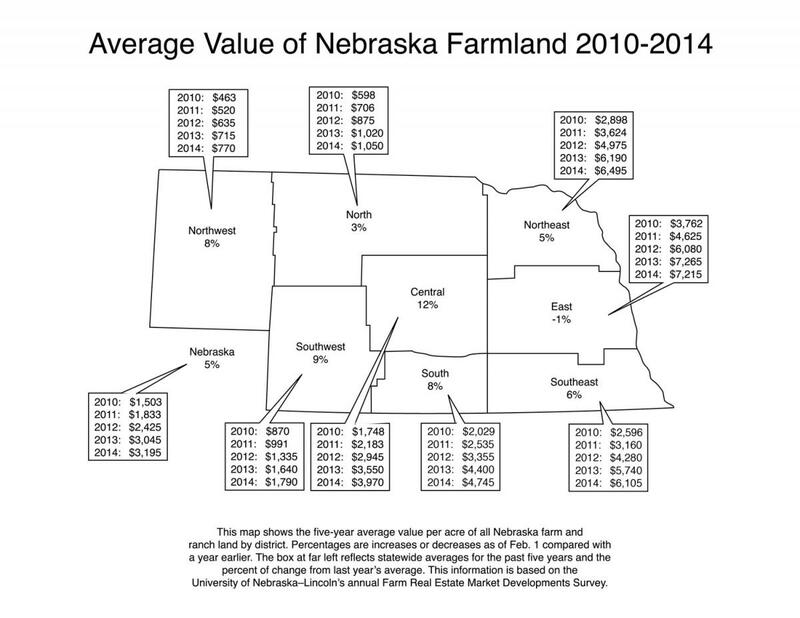 Preliminary findings from the University of Nebraska–Lincoln 2014 Nebraska Farm Real Estate Market Survey indicate as of February 1, 2014, the weighted average farmland value rose by about five percent over the prior 12-month period, to $3,195 per acre. Surveyed 2014 cash rental rates for cropland, on average declined with lower commodity prices, while pasture and cow-calf pair rental rates significantly increased. This was due to higher beef cattle prices, the lingering effects of the drought and the conversion of some marginal land to crop production. Dryland cropland (with no irrigation potential) saw the greatest change in the southwest (39%) and northwest districts (29%). On the low end, the eastern district saw a 5% decline in average reported farmland value. Value of center pivot irrigated cropland saw the greatest increases in the northwest (19%) and north (13%) districts and the greatest losses in the east and south districts (both -2%). Value of gravity irrigated cropland saw the greatest increase in the southwest district (18%) and the greatest loss in the northeast district (-7%). Continue reading the full Cornhusker Economics article and view a table of land values by district and land type. Also see the related IANR news release. See related information from the Department of Agricultural Economics in the Nebraska Farm Real Estate section of CropWatch.unl.edu. The final 2014 Farm Real Estate Survey Results will be posted to this site in June 2014.